Although I am no longer the guardian of Kate’s diaries, I am still able walk in her footsteps. The hottest day of the year earlier this week found me in Rye in Sussex. I was recovering from a short, sharp illness but the overnight visit had been booked ages ago and I really didn’t want to forfeit the outing. However, rather than wafting around Rye as I had envisaged, I managed only to place myself for a brief moment outside the digs in which Kate Frye had stayed in April 1911 and take in the scene before retiring to enjoy a lady-like recline. Kate had been sent by the New Constitutional Society for Women’s Suffrage to rouse Rye to the Cause. She had booked two rooms in the digs – the other was for one of the NCSWS ‘s founders – and Kate’s ‘sort-of’ friend – Alexandra Wright. Their landlady was a widow, Mrs Jane Harvey, who lived in the house with her 23-year-old daughter, Lilian, who worked as a clerk. Like the Rev Llewellyn Smith we were staying at the Mermaid Inn. I doubt it has changed much since Kate escorted him there 105 years ago. If you have a feel for these things – that time is only a thin layer – you might sense the Rye of Kate Frye merging with that of Mapp and Lucia. Did not stop before Ashford and changed there for Rye. Got a porter to bring up my Trunk and walked to Mrs Harvey, 13 Market St. What will happen to me with such a number? Real lodgings – but nice and clean and two nice large bed-rooms – much larger than the sitting-rooms. I went out for a few minutes stroll – came in about 7. Unpacked my bag – had supper at 7.30 – then my box and arrived so I went up and unpacked that – then wrote letters & diary till 10 o’clock. Felt rather tired – and very on Tour – the Sunday night feeling in a strange town being intensified by the Church Bells being practised. [The last comment harks back to Kate’s days as an actress – on tour]. Up in good time to breakfast – wrote a little then out the shops – and then back to fetch Bills, which had been sent in last night – and to start my canvassing. Did all up and down the High St and Mint as a beginning. Didn’t feel very impressed with my work but suppose it is alright. In to lunch at 1 – then at 2.30 out to Playden where I had some addresses and found a lot more. It was a good way so I stuck to that district. No real success – so many people out. In to tea at 5.30. A little more Bill distributing – then to the station to meet Alexandra, who arrived at 6.30. We walked straight up and a man came up with the box. She unpacked and we chatted. Had dinner at 7.30. Talked till 11 o’clock, then to bed. A lovely day. Breakfast at 8.30 – a little writing then Alexandra and I went out to the shops and bought lunch. She came in to do some writing for the rest of the morning and I went paying calls. Met with some success. Got in the Nonconformist set and kept on till 1 o’clock. Alexandra went out again from 2.30 till 3.30 – then came back and a Miss Harris, Winchelsea, and Miss Spalding, the nurse, here came to tea. Out at 5.30 till 7 again – more calls. A lot of people out but we got hold of the Vicar who promised to come. It was very windy all day and rather cold but the view was nice. A glorious day – really beautiful. Breakfast 8.30. Some writing – then I went out. Did the marketing – some canvassing – set Alexandra’s feet in the right direction for Playden and continued my canvassing unto past 1. Came in very tired. Alexandra did not get in till past 1.30. At 3.30, having changed, we went out on business to station & Hotel etc – then tea at a Mrs Clements and her two daughters at 4.30. 4 other ladies were there to meet us. It was rather appalling – but I think I was given a gift. More calls after shopping. Tea at 7. Supper. Talk & writing. Another nice day. To the shops in the morning and then canvassing again. But we are getting to the end of our list, and I really had to slack in a bit. I began to feel very tired – yesterday I was at it all day long. So after lunch I did not go out but had all the Literature to see to. In the evening Alexandra and I went out together. A few successful calls – especially good with the school master. I think Alexandra converted him. Both awfully tired but in to change to go and have supper with Miss Spalding. There was another lady there. We talked all ‘Suffrage’ and came away at 10 – a little warm over our fire and then to bed. Alexandra was very nervous all the evening as to the result of the meeting but I felt sure it would be alright. Showers in the morning but the day was fine. Alexandra & I went out, bought dinner, paid Bills etc and did some jobs. After lunch Alexandra lay down on her bed and went to sleep and I did some of my packing up etc. To the Hall at 4 o’clock to get it settled to our taste – a long job – to put out Literature etc. Back at 5.30. Miss Ogston had arrived and we began on the arrangements. She had had some tea – so we had ours – an egg. Then to change – leaving Miss Ogston to have some dinner at 7. Alexandra and I went to meet the Rev Llewellyn-Smith at 6.30 and take him to the Mermaid Inn. A chubby, cheerful young clergyman who seemed quite ridiculous when he spoke, as he constantly did, of ‘my wife’. Leaving him to dine, we went on to the hall soon after 7. A Mrs Harrison and a Miss Mac Munn had arrived from Hastings so Alexandra took them back to Market St to have a rest – while I waited. [I] received the Stewards – two Miss Harrisons of Winchelsea, Miss Spalding and Miss Clements. They sold Literature and the Misses Harrison and I took the collection – £1-3-7. Lady Brassey took the Chair and her daughter came with her in a lovely car – they had to drive 50 miles so it was awfully decent of her, but she is very keen. A Lieut Col A Savile came to assist Lady Brassey take the Chair and spoke after her. Then Miss Ogston – then Mr Smith. I didn’t hear the speeches as I was outside with the boys – then in amongst some rather troublesome youths. But nothing happened and we had an excellent meeting – quite full and overflowing. The Vicar came, bringing Miss Proctor, who had vowed she would not come. I was very glad when it was over. Every one congratulated us and seemed to think it was a record for Rye. Miss Ogston went off with the Harrisons of Winchelsea. Mr Smith and Miss Spalding walked up with us – then went on to their respective houses. Alexandra and I had an egg each and some bread & butter. Then I went through the Literature and collection and we did accounts til midnight. Then to bed. We woke to a pouring wet day and it kept on till after 12. The Rev Mr Smith appeared before breakfast was over – buoyant as ever. Then Miss Spalding came in and we all talked. She did not wait long, but he did not go till 11.30 or after and then we had to drive him forth. I went out about 10.30 to buy the dinner after I had packed up the Literature Box, and then we sat talking. Alexandra and I at last got upstairs to finish our packing – and left our boxes to come by Advance Luggage. Had lunch at 12. Then to the station for the 12.55 train – after parting with Mrs Harvey, our most kind and moderate landlady. Kate was sent back to Rye later in the year but unfortunately Mrs Harvey’s digs were unavailable and the new ones not nearly so agreeable. Amongst all the other details of this second visit, she did record one incident in Market Street – outside the Guildhall. The ‘hot penny’ ceremony is associated with that of the election of the new mayor – and is still carried out today. Did my shopping and met Miss White. We were just against the Guildhall and saw the Mayor & Corporation come forth. It was so funny. I laughed till I cried – such frock coats and top hats on such heads. Then we watched the ancient custom of throwing pennies from the Hotel Balcony to the crowds below – such a scramble as good many got hard bumped. A good many pounds must have been thrown away like that – some of the coppers were thrown out hot on a shovel. Then out 3 till 5.30 to Playden. Met two very violent ladies – one good Christian woman, entertaining a working party for the Church, pushed me out. You can listen here as Anne McElvoy and I recreate the NUWSS’s February 1907 ‘Mud March’ in an episode of the BBC Radio 4 series ‘British Liberalism: The Grand Tour’. Anne McElvoy retraces a votes for women march, led by the non-violent Suffragist movement, to rediscover the story of its liberal leader, Millicent Fawcett. With Elizabeth Crawford and Ben Griffin. This summer is passing so quickly that I realise that I’ve missed – by two weeks or so- the 100th anniversary of Kate Frye’s final involvement with the New Constitutional Society for Women’s Suffrage. Still – better late than never -it would be a pity not to record an eye-witness account of the final ‘suffrage’ procession, which had morphed into one claiming for women a ‘Right to Work’ for the war effort. Kate has been married for six months and is now ‘Mrs John Collins’ – but ever since the wedding John has been based at army camps on the east coast so she is, as before, living alone in her digs at 49 Claverton Street, Pimlico. You can read about Kate Frye’s work as an organiser with the New Constitutional Society for Women’s Suffrage in Campaigning for the Vote: Kate Parry Frye’s suffrage diary. – for full details see here. A very dull morning and it just started to rain as I went out. I was prepared for wild weather as the wind too was very fierce – a short grey linen dress – a woollen coat to keep me warm – Aquascutum – boots and rubbers – a small cap tied on – and an umbrella. It was fortunate I was so prepared as it turned out a wicked day and rained till 4 o’clock. I went by bus to Westminster and walked along the Embankment to see if there were any signs of preparation but it was pouring by then so there was nothing. I went to Slaters in the Strand and had some lunch and back on the Embankment by one. There from the paving stones sprang up marshalls and assistant marshalls (I was a marshall with a broad red sash) all like me hurrying to posts. Mine was 101 and only 100 were given out – so I claimed mine and stood behind the last soldier with 101 until nearly 3.30. But the rain kept the people away who would have filled the last of the 125 sections and we marshalls and assistant marshalls had very little to do. Our section commander never came along at all so we had to organise ourselves. Miss Barnes of the Knitting Dept came along to be in my section. She is a thoroughly good sort. Just before 3.30 we discovered if we were to march we must arrange ourselves – so a few people did one thing – a few another. I ran down the line telling people to come along and so we caught up with the front. Banners and bannerettes were hastily pulled out of carts and we were off. I went up and down giving directions and making us as trim as possible. We were a motley crew but we had some fine banner bearers and the greater number of us looked very neat in rainproof coats. And so off again on the great Women’s Patriotic Procession organised by Mrs Pankhurst and led by her. Mr Lloyd George received a deputation of women concering Munitions. 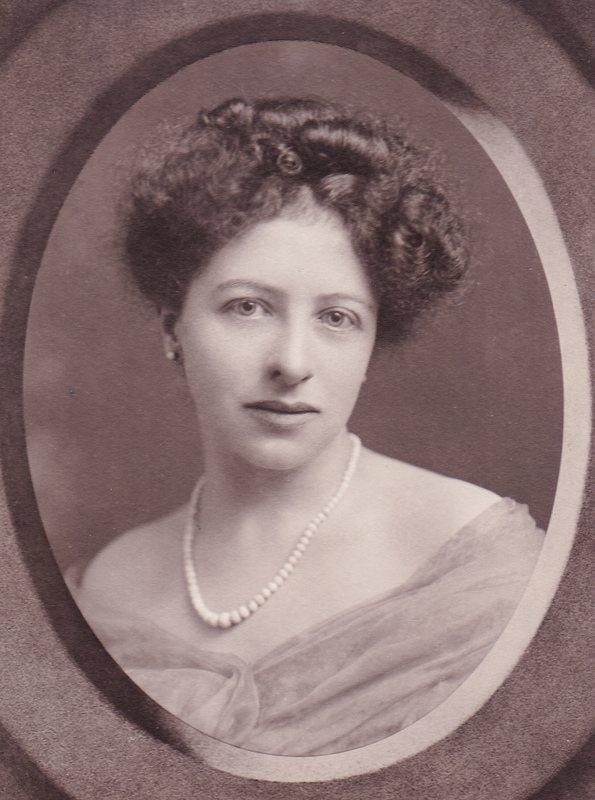 Mrs Chapman [president of the New Constitutional Society for Women’s Suffrage] walked all the way in the first section and went in with the deputation. It was a long and interesting procession but would have been longer had the weather been better. But the rain stopped about 4 o’clock and actually just as I got back to the Embankment at 6 o’clock the sun came out. The procession started off at 3.30 sharp. There were no end of Bands and they helped one tremendously. The route was long – Embankment, Whitehall, Cockspur St, Pall Mall, St James, Piccadilly, Park Lane, Oxford St, Regent’s St, Haymarket, Northumberland Avenue on to the Embankment again when we gave up banners and those who could went along on to hear Mr Lloyd George speak from a balcony looking over the Embankment. I saw him watching the whole thing from there as we went along. Such a crowd to watch us all along the route and the Clubs packed with people. At intervals tables with ladies taking signatures of women ready to do munition work. It was very inspiring and invigorating and though I felt very tired and seedy before I think the walk did me good. I was a bit stiff and glad to sit down. I made my way to the Strand and had some tea. Kate Frye (1878-1959) – was resurrected by ITV who put her (played by Romola Garai) in a series – The Great War: The People’s Story – and commissioned me to write her life. This story of an ordinary Englishwoman will appeal to all those interested in a real life lived – from the palmy days of Victoria to the New Elizabethan age. For more details read here. Kate is living in Pimlico and still working at the office of the New Constitutional Society for Women’s Suffrage in Knightsbridge. The society is now devoting itself to supporting the war effort. To office and a very busy day. 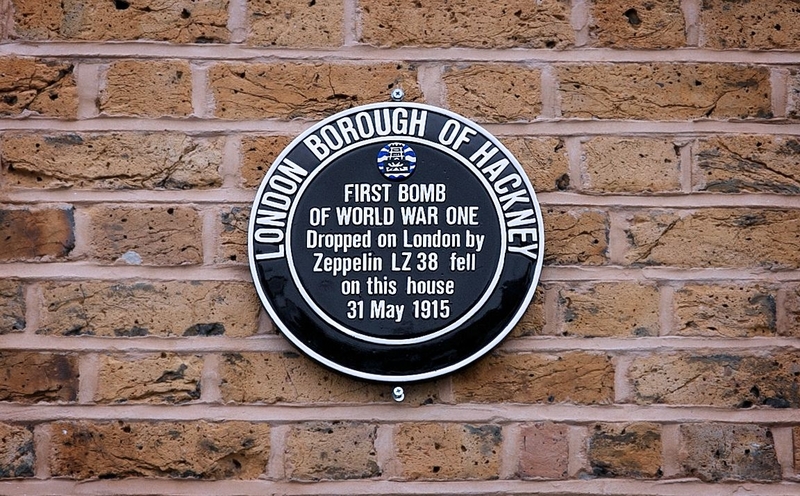 News of a raid on London last night – Zepps – and bombs have been dropped – some deaths. No places mentioned but I know they went to the East End. So it’s come at last. It is a horrible feeling. I had a quick lunch with Constance [Constance Gilbey, her cousin] at Tudor. had to go back before 2 o’clock though everything was ready for the meeting and it was a packed one. 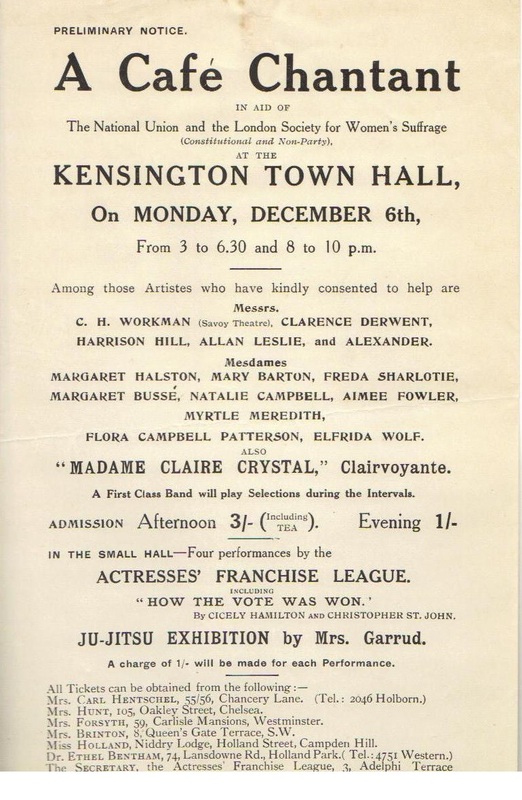 We had it in our Hall – and the speakers were Miss Damer Dawson – on the Women Police Service and Alexandra [Wright] on the Canteen [set up by the New Constitutional Society at the Enfield Lock Small Arms Factory]. I thought the latter did very well for her, but of course she could not be other than herself and a sort of unpleasingness creeps in and after Miss Dawson who was just delightful – well there it was. But the meeting was a great success – though as I told Mrs Hartley it was a Women’s Police audience and not ours. Cleared up as much as I could – then as Alexandra and Mrs Fausset waited we ended by walking across the park together. We saw A. to her turning and then went on and had some dinner at Arthur’s Stores. Mrs Faussett’s husband is down with scarlet fever and she is very lonely. We walked together to Royal Oak where she got a bus and I continued my ramble to Marble Arch. Stopped on my way to send Post Cards to Mother, and John to let them know I was safe. Of course all our talk was of Zepps – everyone feverish with the subject and none of us too comfortable about the matter. Margaret Damer Dawson was one of the founders, in 1915, of the Women’s Police Service. Tomorrow – 24 September – I shall be presenting Kate Frye to the Wooburn Festival. I shall be talking about her life – from the age of Victoria to that of Elizabeth – in Bourne End and Berghers Hill – and describing her efforts to interest the area in ‘Votes for Women’. The talk will be illustrated with many photographs from Kate’s extensive archive and there will be an opportunity to look at other items of local interest from her collection that I will bring with me. See here for full details of the talk – 7.30 pm at Bourne End Library. Copies of Campaigning for the Vote will be on sale – signed if you wish! For full details of both the Kate Frye books see here and here. ITV have issued this press release which includes mention of my forthcoming e-book, to be published by ITV, Kate Parry Frye: the long life of an Edwardian actress and suffragette. ITV Studios Global Entertainment (ITVS GE) and Imperial War Museums have signed a deal with Random House for The Great War: The People’s Story, a hardback non-fiction book to accompany the TV series. Written by Izzy Charman, the TV series producer, and published in partnership with Imperial War Museums, the book provides a narrative of the war years as seen through the eyes of the people featured in the show. The book will be available from 31st July. ITVS GE will also be publishing three e-books based on three of the individuals in the TV series. Written by daughter Pamela Campbell, Reg Evans DCM – A Hero’s War In His Own Words is about a young soldier who was one of the first people to undergo facial surgery in Britain after a gunshot wound to the face. In Alan Lloyd – The Lost Generation, Izzy Charman tells the story of the just-married officer, a member of the privileged Lloyds banking family, who died in battle. Author Elizabeth Crawford explores the story of a working suffragette in Kate Parry Frye – The Long Life of an Edwardian Actress and Suffragette whose suffrage society turned to war work. All three e-books will be available from 31st July. Romola Garai plays Kate Parry Frye in The Great War: The People’s Story. 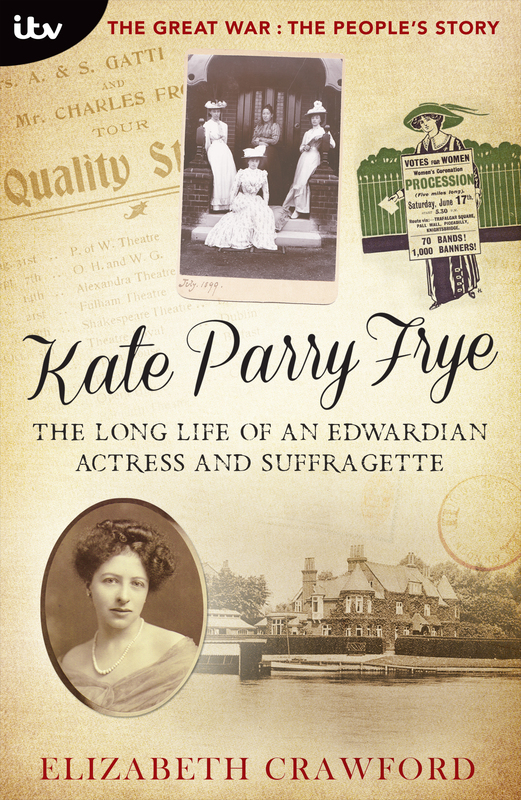 I tell the whole story of Kate’s life (1878-1959) – based on her own outstanding diaries – in Kate Parry Frye: The Long Life of an Edwardian Actress and Suffragette to be published by ITV as an e-book on 7 August 2014. 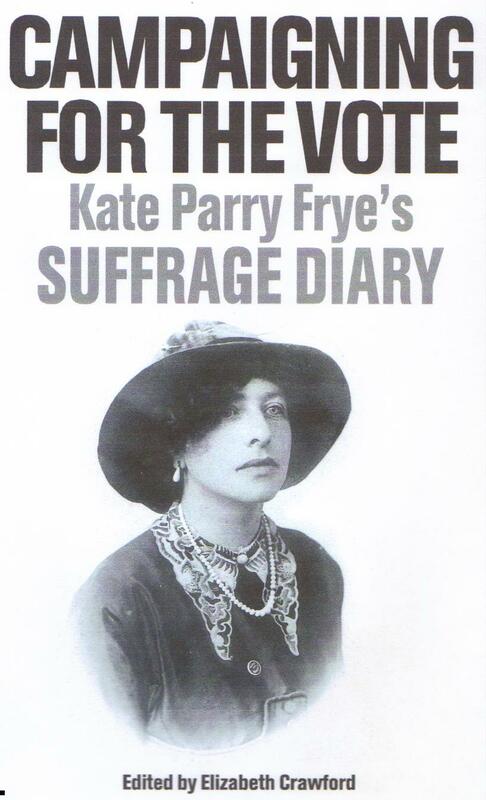 Kate’s years as the organizer for a suffrage society are told in Campaigning for the Vote: Kate Parry Frye’s Suffrage Diary, published by Francis Boutle in 2013. You are currently browsing the archives for the Kate Frye’s suffrage diary category.